Here’s a fun thought experiment: what does your spouse look like in freefall? Now: how about your supervisor at work? Your aunt? Your grandma? Your chaplain? Your english professor? 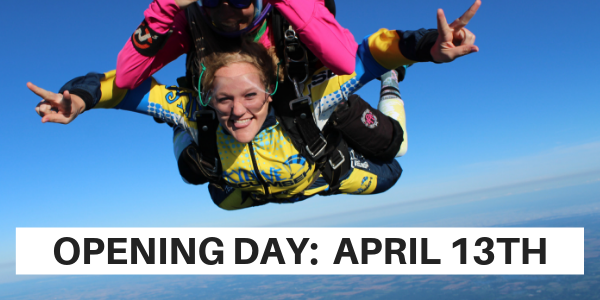 We think you should come to Skydive Tecumseh and find the heck out. First of all: it’s hilarious. And secondly, it’ll do all of you a world of good. And y’know what? Group skydiving discounts make it achievable! Here’s what you need to know. 1. Group skydiving brings people together like nothing else. Making a first-time tandem skydive as a group is an intense bonding experience, to be sure. From the first nervous moments on the ground to the building confidence in the classroom briefing, the side-by-side harness kit-up and the wiggle-kneed boarding of our beautiful skydiving aircraft, the whole process has a way of uniting folks across perspectives and generations like nothing else we’ve seen. 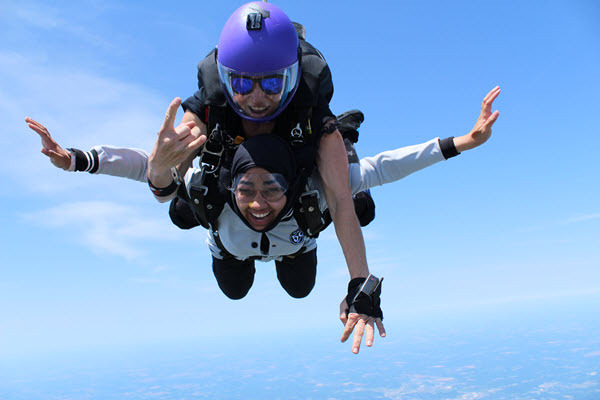 Skydiving with a group has an amazing power to strengthen the bonds between individuals. This is the kind of phenomenon that “team-building” doesn’t even begin to describe. Make no mistake: whatever “team” you’re on — whether it’s for family, work, church, school or anything else — will benefit from the zap of energy a skydive confers. 2. Group skydiving makes the fear a little less and the fun a little more. Nervous about your skydive? Of course you are! Everybody is. Point of fact: if you decide to go it alone, you’re statistically considerably more likely to chicken out. Bringing your tribe along with you increases your accountability, so you’re much more motivated to face your fear and emerge victorious. 3. Group skydiving saves everybody money on a life-changing experience they’ve been wanting to try for years. These discounts scale according to the size of the group, so bigger groups mean sweeter deals — and more people with a fresh check on their bucket list. Don’t waste another minute. Let’s get you and your tribe in the sky! We’ll be proud to call you part of ours.